by the Rector of Meonstoke. church’). The first St Peter’s was built a little later than St Andrew’s Meonstoke, and the present building is a renovation dating from the early 16th Century, although much that is older has survived. The photograph of the fifteenth century tower shows a skull and two heads, a key and a purse. The medieval legend that the tower was built by a butler and a dairy maid, represented by these carvings, is supported by a tablet within the tower. This records that the tower was ‘built by servants and restored by servants’ in 1881 with the sum of £70 being raised by servants from all over Hampshire. The Curle Chapel is named after a Royalist Bishop of Winchester who defied Cromwell and who fled to the safety of his sister’s home in Soberton during the Civil War. His memorial may be seen in the corner. 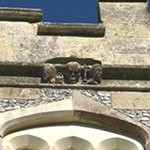 The three stone heads were discovered during the Victorian restoration of the church but it is not known what they represent. The chapel houses some of the earliest and most important wall paintings that remainsin the Meon Valley. They date from the 1330s and can be seen in the window recesses. They are thought to represent the Virgin Mary as a child, St Anne, St Katharine of Antioch and possibly St Barbara. Do look at the stained glass windows installed by the Victorian Blashford family of Soberton Towers. The resurrection of Jesus Christ is depicted in the window in the north aisle. Jesus died that our sins would be forgiven; we are now pure and holy in God’s eyes; death will not be the end for us; as Christ was risen, so shall we be when he returns. Opposite, in the south aisle, the three Christian virtues of Faith, Hope and Charity are represented. Lastly, look at East Window above the altar and reflect on the words: ‘Come unto Me all ye that labour and I will give you rest’. This is a promise that God still loves to keep. Please pray for yourself and those you love.